Free Republic of Liberland (hereinafter “Liberland”) is a sovereign state located between Croatia and Serbia on the west bank of the Danube river. Liberland came into existence due to a border dispute between Croatia and Serbia. This area along the west bank of the Danube river is not claimed by Croatia, Serbia or any other country. It was therefore terra nullius, a no man’s land, until Vít Jedlicka seized the opportunity and on 13 April 2015 formed a new state in this territory – Liberland. The boundary was defined so as not to interfere with the territory of Croatia or Serbia. Its total area of approximately 7 km² is now the third smallest sovereign state, after the Vatican and Monaco. The intent here, according to an interview with its founder, is to create as "libertarian" or anarcho-capitalist a "nation" as possible. "Galt's Gulch Europe", one might say, but without the sci-fi defense system in the Ayn Rand novel. Government police from a bordering state are attempting to block entry into the actual region, but it is apparently still accessible from the Danube River. The enthusiasm around the project has already attracted some $40 billion in intended investment capital. It remains to be seen whether the new nation will thrive: the astrological chart, however, reflects the stated intent of its founder very well. Not "perfect", but really quite strong. The apparently strong capitalist signature helps with the "libertarian" thing. We'd know much more with a time of "birth", but the mixed signature tends to lean to the "liberal". Not a bad thing in this context. Sun-Uranus square Pluto: rebellion against power. 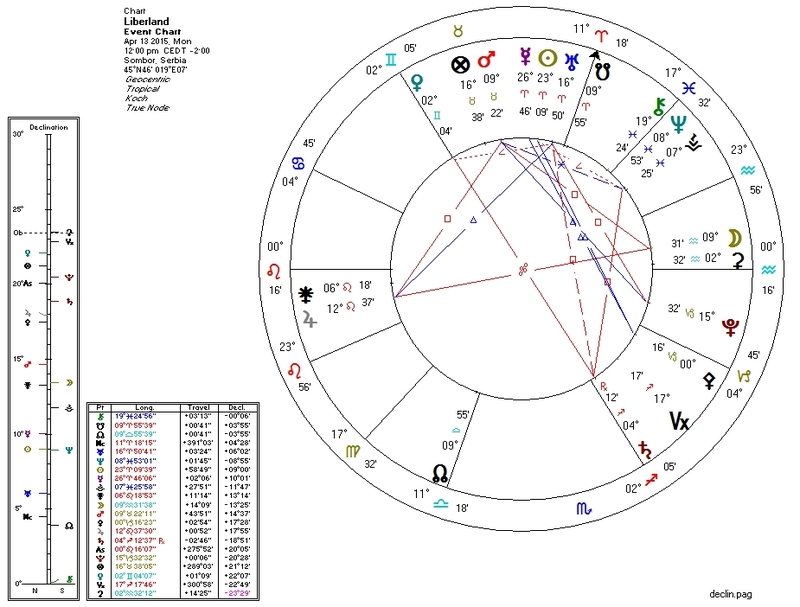 Jupiter-Mars-Moon T-square: ideology plus land, attacked by contention/force? Jupiter parallel Pallas: the ideology in question is libertarianism. Venus in Gemini opposite Saturn and semisquare Uranus: difficulty moving resources in and out? Perhaps in this way, the weak square from Venus to Neptune suggests that the solution is transit by water?